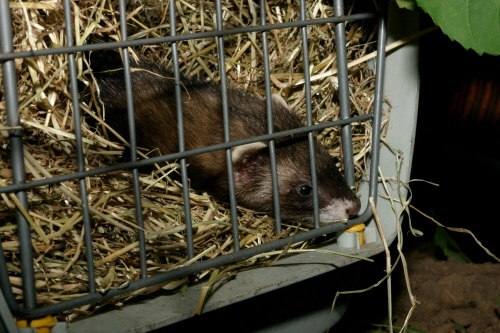 Rob Scrivens of the RSPCA Wildlife Centre at Stapeley Grange, Nantwich, arrived at the Wilderness Farm on 27th September with a demountable cage and three polecats for release to the wild. We selected a site for the cage near the top of the slope leading down to the River Alyn, underneath the branches of an old cherry tree, which leant right over with its topmost branches resting on the ground. 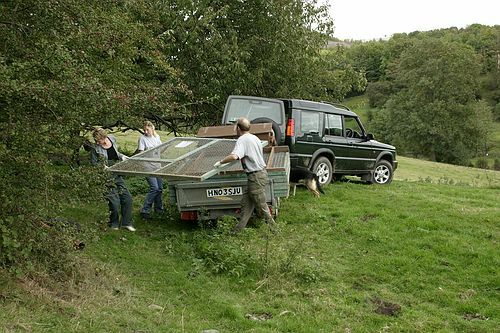 Rob Scrivens and his two volunteers start to assemble the cage which is to be the polecats' temporary home. 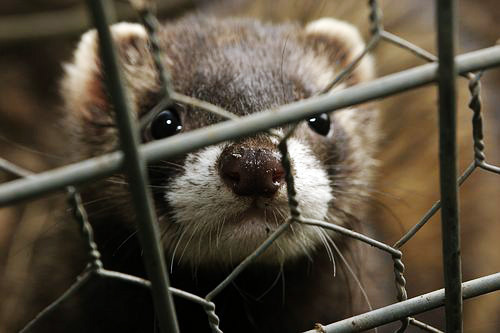 Fran, Lorena and the volunteers wait for the polecats to emerge from their box into the cage. In the transport cage, but testing the scent of the strange new surroundings. Out into the spacious new cage, examining the photographer closely! Thorough exploration of their new home. 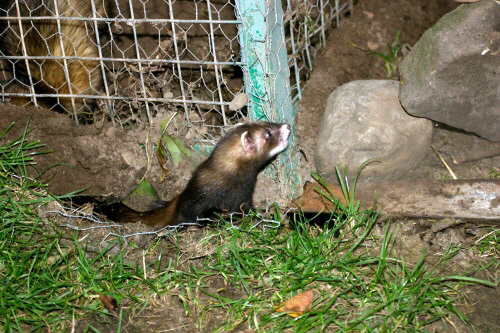 Unlike the foxes, the polecats seemed happy with their accomodation, but set about improving it by digging short tunnels within the cage. 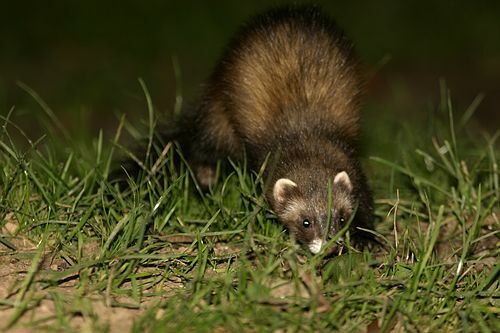 By 12th October, the polecats had still not dug their way out, so we released them. 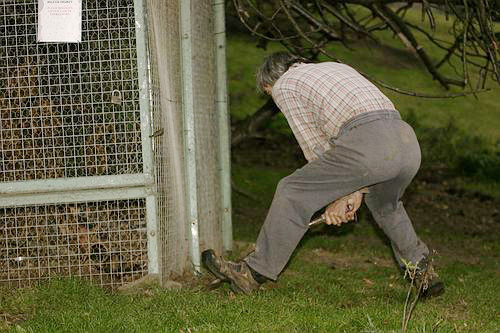 Here, Bill raises the cage to let them out. Out into the wide world .. 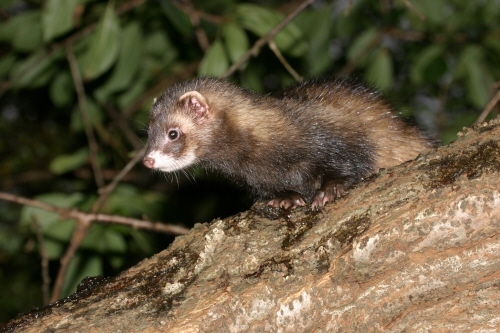 The three polecats were soon all out of the cage, exploring the neighbourhood. 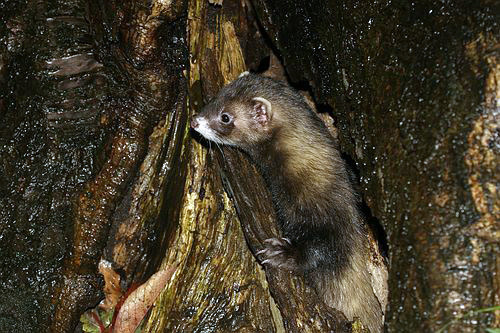 Threat posture towards the camera. The cage had been set up next to an ancient and drooping cherry tree. 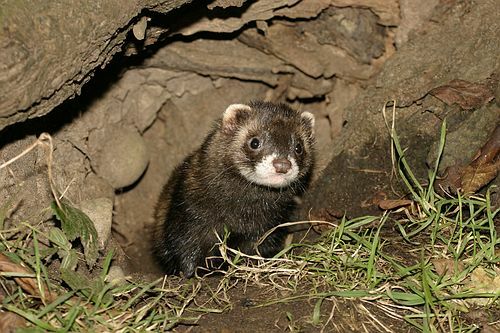 One of the polecats disappeared into a hole at its base, and after rummaging around, reappeared with a property-owning look on its face! 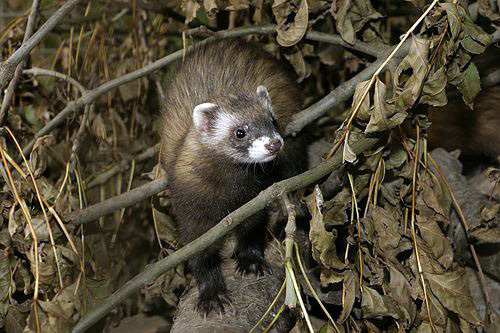 Next day two of the polecats were still resident in the cherry tree, and immediately appeared when we arrived with food and banged on the trunk. 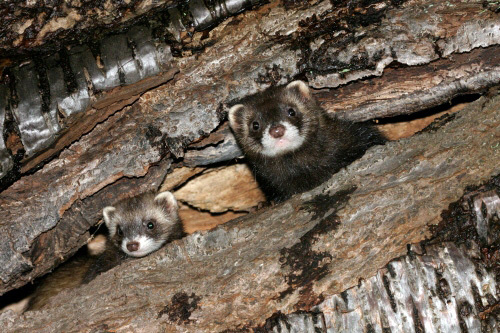 The cherry tree was hollow for a long way up, and the polecats used a crack in the trunk well above eye level to check out visitors. They came out and clambered up the tree (drooping nearly to the horizontal) in order to drink water from pools of rainwater further up the trunk. 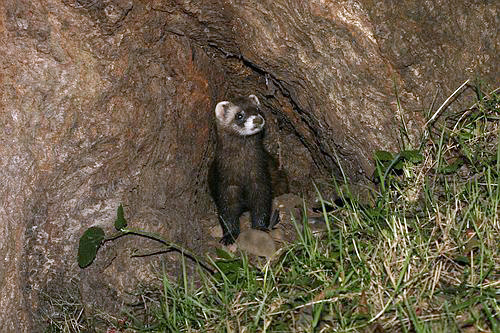 After a while, only one of the polecats were still resident in the cherry tree, and this was one of the last batch of photos, taken on 30th October. 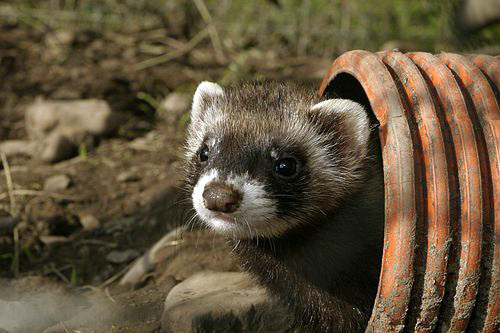 The polecats stayed with us for well over a month. 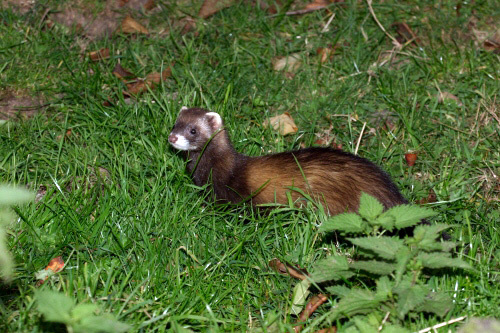 We released them from the cage when they still had not dug themselves out after a fortnight, and at least one stayed in the cherry tree for another three weeks. All three are now making their own way in the world, but whenever one of us passes the cherry tree, we hopefully knock the trunk and call out "Cats! Cats!". I hope that, sooner or later, we shall see one of our cute but ferocious guests again.